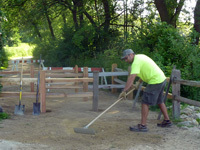 The Friends of the Lakeshore Nature Preserve is a non-profit membership organization that supports the Preserve in a myriad of ways: through volunteering, fundraising, stewardship projects and interpretive programs. They offer excellent free guided field trips and nature walks and maintain a rich and extensive website that is well worth exploring. The Students for the Preserve is an emerging student group at the University of Wisconsin–Madison. Their mission is to foster student appreciation for the Preserve and the opportunities it provides for research, outreach, and recreation. 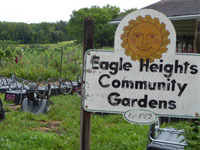 The University of Wisconsin’s Eagle Heights Community Gardens (EHCG) was established in 1962 to offer Eagle Heights residents, the UW-Madison and surrounding communities the opportunity to participate in an organic community garden. EHCG is one of the oldest and largest community gardens in the United States. At last count, the pool of gardeners speak approximately 60 languages. The gardens feature gardening practices from around the world. Located within the Lakeshore Nature Preserve, the gardens provide a wonderful place for meeting fellow gardeners, family picnics and walks, and bird watching. As described on the Biocore website, “Students and staff from Biocore’s Evolution, Ecology, and Genetics courses are restoring an old field near Picnic Point to tall grass prairie and monitoring its progress. Each new class of students is learning ecological principles and methods by contributing to multi-year research projects at the Biocore site.” This prairie can serve as a model for other restorations in the Preserve, and the use of fire in its management can be extended to other Preserve ecosystems that will also benefit from controlled burns. 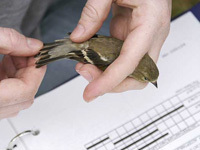 The Biocore Prairie Bird Banding Station (or Observatory) is an all-volunteer operation that monitors bird populations in the Preserve, above Picnic Point. They welcome volunteers of all skill levels, and will teach volunteers how to band birds. 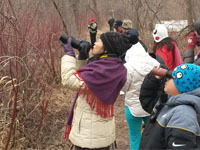 Banding offers a wonderful opportunity for people to see birds up close, learn about their migration and nesting patterns, and understand how natural areas enhance their biological success. The Observatory provides opportunities for students to do research projects in the summer, and for individuals to use as a research resource. The College of Agricultural and Life Sciences (CALS) operates research plots in the field north of the Eagle Heights Community Gardens. The Center for Integrated Agricultural Systems, a research division of CALS, provides oversight for F.H. King and GreenHouse Learning Community gardens. F.H. King is a student organization dedicated to promoting sustainable agriculture at the University of Wisconsin, Madison. It maintains an organic demonstration garden adjacent to the Eagle Heights Community Gardens. 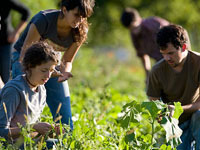 The garden is a university resource where students, faculty, staff, and community members can practice sustainable, organic production techniques. The produce is distributed among volunteers, and the surplus is donated to local food pantries. The Experimental Archeology Laboratory is located in the “working landscape” of the Preserve near the Grounds Storage Area and the the Eagle Heights Gardens. It is the site of two kilns used by students and faculty to study traditional wood-fired methods of firing and glazing ceramics. The Anthropology department builds and fires a clay kiln each year as part of its Ancient Technology and Invention class. Outdoor UW is the University of Wisconsin-Madison’s outlet to the outdoors. A program of the Memorial Union, Outdoor UW includes outdoor equipment rentals, outdoor education, and the legendary UW Hoofers outing clubs. UW Hoofers runs recreational outings all around the state and nation, but some of its most celebrated activities—canoeing and sailing in particular—take place on the waters of Lake Mendota and often involve exploring the Lakeshore Nature Path from the water. Outdoor UW rents kayaks, canoes, and stand-up paddleboards, so it’s a great way for UW-Madison students to get access to equipment for exploring the Preserve from the lake. In the winter they rent snowshoes to give you another way to explore the Preserve! The Campus Event Services Office assists Wisconsin Union members, student organizations and campus departments in planning and coordinating events and campus activities in the Memorial Union, Union South and other campus buildings and campus outdoor spaces including Picnic Point fire circle reservations and Howard Temin Lakeshore Path run/walk requests. In addition to maintaining the lawns, flower beds, and landscape trees of the main campus, the staff from the Facilities Planning & Management Physical Plant-Grounds Department also provides support to the Lakeshore Nature Preserve by removing hazard trees, splitting wood for fire circles, and maintaining the Howard Temin Lakeshore Path.